Canadians are increasingly turning away from regulated lenders, but it may not be as risky as you would expect. A Bank of Canada (BoC) working paper titled The Rise of Non-Regulated Financial Intermediaries in the Housing Sector and its Macroeconomic Implications, argues that non-regulated lenders are taking a bigger share of the mortgage market. The paper with the catchy name, was authored by BoC researcher Hélène Desgagnés. In it, she argues that regulated banks still “dominate” the mortgage market. However, they’re losing share rapidly to non-regulated intermediaries. Despite being non-regulated, she also argues that they’re no worse off than any other bank. Non-regulated financial intermediaries (NRFIs), sometimes referred to as shadow banks, are lenders not bound by regulations. In contrast to regulated financial intermediaries (RFIs), such as federally or provincially regulated banks and credit unions, NRFIs can’t take deposits. That’s not a huge problem for them, since they don’t have to satisfy a minimum capital requirement. The increasing market share of these lenders is widely blamed as a primary contributor to the US Great Recession, but the BoC thinks… uh, it’s different this time. The working paper states, “One could expect NRFIs to issue riskier loans, but this is not the case, at least in Canada.” Turns out these lenders offer lower rates, and securitize the bulk of their mortgages. 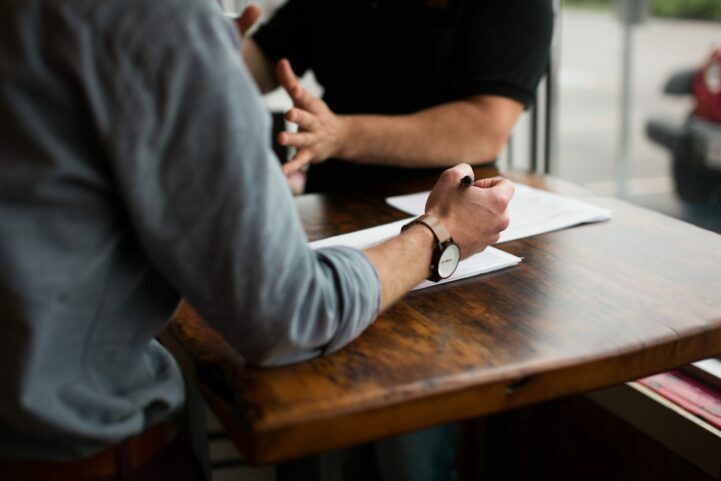 The BoC found that NRFIs offer lower mortgage rates than regulated lenders, in order to attract those with the best credit scores. Since they can’t raise capital easily, they use securitization to limit risk. The vast majority of securitization in Canada is done through the government’s National Housing Act Mortgage-Backed Securities (NHA MBS) program. This program is federally regulated, and in order to participate, these loans have to have the same criteria as regulated institutions. In addition, NRFIs issue securities and sell them to regulated financial institutions. If your bank is buying them, are they any riskier than your typical mortgage? Note: The working paper only considers “monoline lenders,” non-deposit-taking lenders that specialize in mortgages. Monoline lenders offer the lowest rates to qualified lenders. These are not private lenders, that typically offer higher rates than your bank – and we have almost no stats on. The share of mortgages issued by non-regulated financial intermediaries is a closely gaurded secret, so there’s no hard data. To get a proxy for this number, BoC’s Desgagnés poured over securitization data from 2006 to 2013. This won’t give us a picture of how unsecuritized mortgage issuance is evolving, but it does show that these lenders are rapidly expanding in the NHA MBS market share. In 2006, NRFIs only represented 2.07% of the securitization pool, according to a Canada Mortgage and Housing Corporation (CMHC). The latest data in 2013, shows that NRFIs issued 14.42% of the pool. At the very least, they’re rapidly expanding in the securitized loan industry. Since these lenders are going after the best qualified borrowers, they issue loans with lower interest rates and higher median mortgage sizes. The working paper finds that securitized mortgage borrowers pay an average of 25 to 29 basis points more at regulated banks, vs NRFIs. 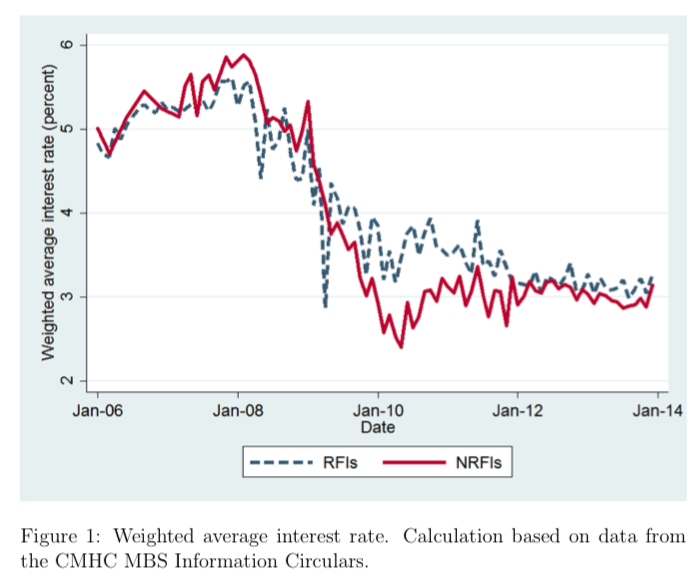 The median mortgage size at NRFIs was also 14.51% higher than that of regulated banks, from 2006 to 2013. These lenders likely aren’t being used by borrowers rejected by regulated lenders. They’re an ideal market… on paper at least. A higher rate of mortgages being issued by non-regulated lenders sounds scary, but the BoC working paper argues otherwise. The intermixing of these loans throughout the broader system likely means those that have been securitized, aren’t far off from quality from those issued by federally and provincially regulated lenders. Although, we’re starting to see that the loan documentation process at Canadian banks isn’t stellar these days. This is actually the problem they had with US shadow lenders. Many of the loans were being written by non-regulated lenders, and sold to the big US banks. These loans are now taxpayer issues, once they get securitized. Mortgages need third party verification, not issuance from any clown making minimum wage. Jimbo, you’re spot on as per usual. Eventually, if the debt is good, a financial institution will pick it up in a bundle. Even if the big 6 aren’t exposed directly, I can only assume a number of these home owners have a good mortgage, or mortgages, with a large bank. All it takes is a price depression and a loan/property to completely fail to cause a chain reaction. The fact that the government brushes off shadow lending that, as of 2013, accounted 14% of mortgages is a joke. It has only accelerated; where are we close to 20% in 2017? With tighter REGULATED lending, I can’t believe it isn’t in the low 20s by the end of 2018. Unless these alternate lenders are getting their money for free (essentially the big banks are, since they pay almost nothing on deposit accounts) I can’t see the business case. Or do they expect to lend at a loss, but make up for it on volume? There HAS to be something else behind this. Some other reason for lending the money. It CAN’T be profit. lmao these finance companies operate under Originate to Distribute model, where they originate (give mortgage loans to borrowers), and then directly sell it off to have it bundled up, securitized, and repackaged to be sold off to investors as Mortgage Backed Securities (MBS). The spread between the interest they earn off the mortgage minus the interest they pass through to the MBS issuers is where they make the money. Go watch The Big Short, then come back and tell us, with a straight face, that this isn’t risky.